From one supermarket, FairPrice has grown to become Singapore’s largest retailer, with a network of more than 230 outlets comprising FairPrice supermarkets, FairPrice Finest, FairPrice Xtra, FairPrice Xpress and Cheers convenience stores. The group’s consolidated turnover has reached US$2.2billion. Today, with its multiple retail formats serving the varied needs and interests of people from all walks of life, the social mission of NTUC FairPrice has evolved to make the dream of living well accessible to everyone by moderating the costs of the good life. Many Singaporeans grew up with NTUC FairPrice being integral in their lives. 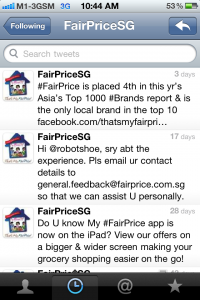 NTUC FairPrice is one of the first supermarket retailers to engage customers through social media. The group started to use social media to engage customers and potential shoppers, on many fronts. In August 2009, NTUC FairPrice launched the That’s My FairPrice (TMFP) Facebook profile page as an extension of its branding strategy in reaching out to a younger group of customers. This initiative was widely successful as the Facebook page managed to garner over 1,000 fans in just three hours after it was launched. The Facebook page has over 37,000 fans to date. NTUC FairPrice has set up this social platform as a place where families and community can meet and bond. Through this, NTUC FairPrice is able to share and inform customers with its latest announcements, like store openings, promotions and customer events. It also celebrates key festive occasions with the community, and they in turn share their lives and aspirations with NTUC FairPrice by posting pictures of their families and happy moments. 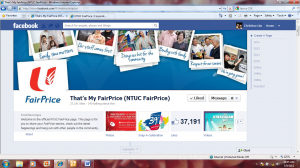 NTUC FairPrice involves its customers in various CSR related activities on Facebook. This is an avenue for fans to directly interact with the brand, and shoppers have begun to feel personally invested in the business and proactively communicate with it. 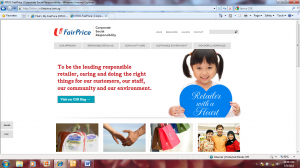 Recently, NTUC FairPrice has also started a blog to provide updates on its CSR activities. Through the blog, the brand shares news, pictures and videos with the online community. NTUC FairPrice has also recently launched an official Twitter account, @FairPriceSG, to keep customers updated on the latest announcements and promotions at FairPrice as well. Beyond this, NTUC FairPrice has also launched a wine pairing iPhone/iPad app that can only be described as ‘uniquely Singaporean’. The application pairs wine with popular Singaporean dishes rather than European dishes, unlike most of the other applications available in the market. The brand rallied its social community to co-create the wine pairing list featured in the app. The brand also has a “My FairPrice” iPhone/iPad app to make it easier than ever for grocery shoppers to plan their shopping even before stepping into the supermarket. The My FairPrice app promptly provides money-saving tips, recipes and weekly promotional information at FairPrice’s network of over 100 supermarkets, FairPrice Finest outlets and FairPrice Xtra hypermarkets to help customers keep within their grocery shopping budget. It also provides customers with convenience at their fingertips, allowing them to create multiple shopping lists and even search for the nearest FairPrice store in their vicinity. The app has over 70,000 downloads within 3 months of its launch. As a forward-looking retailer, FairPrice recognizes the need to innovate and look for ways to better communicate with different consumer segments through various platforms, including social media. NTUC FairPrice understands that consumers want to have a say and contribute to the brands that they buy. With Singaporeans becoming increasingly stretched for time, the brand wanted to look at new ways to help make customers lives easier. NTUC FairPrice is excited that its initiatives have been met with such great response, and looks to continue to explore new ways of engagement. Within a year following the launch of the social media platforms, NTUC FairPrice’s brand equity score grew and the brand was found to have enjoyed extremely strong emotional bonding with customers, according to the Shopper Trend survey. With the growing number of fans on Facebook, NTUC FairPrice has definitely increased its brand awareness to the more technology-savvy online consumers in Singapore. More online consumers are becoming aware of the brand and are also taking opportunities from updates on promotions. In the 2012 Asia’s Top 1000 Brands report – based on a survey conducted by Campaign Asia-Pacific and Nielsen where respondents are asked to name the best brands that came to mind – NTUC FairPrice is the only local brand to be in the top 10 list. Apple, Samsung and Sony were the top three brands named, followed by FairPrice in 4th place. The report cited NTUC FairPrice’s “marketing initiatives and investments into local community programme” as the key reasons for being the only local brand to retain its position compared to last year.